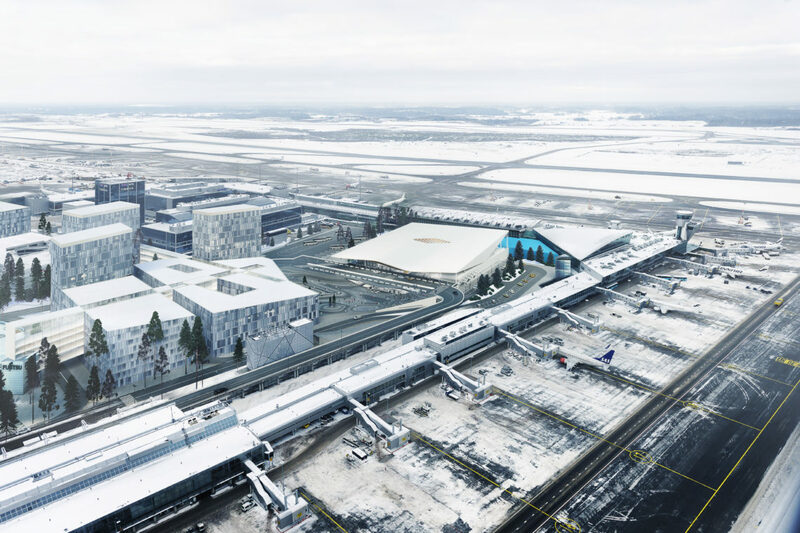 The terminal expansion, mentally linking Finland with the World, comprises two building volumes: “City Hall” and “Security Box”. “City Hall” houses the departure and arrivals halls, and “Security Box” the security check and baggage claim areas. 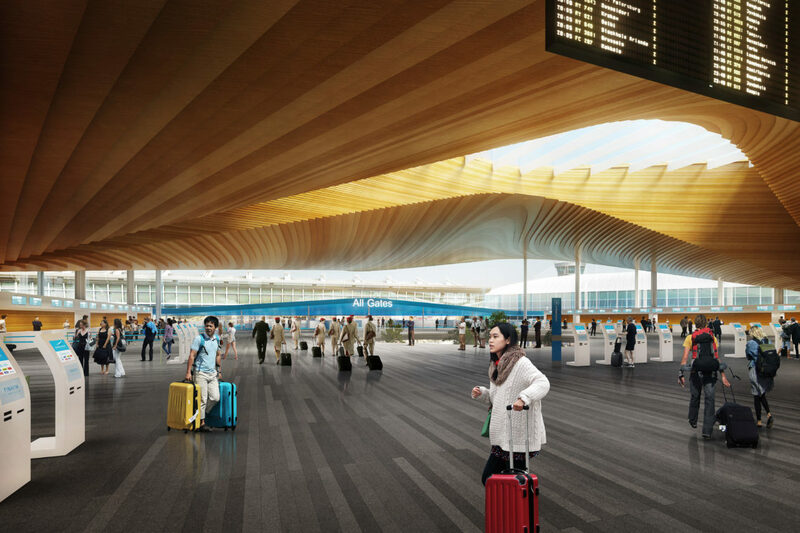 The existing departure and arrival areas of terminal 2 will be fully transformed into gate areas. This solution provides both passengers and services with plenty of additional space. 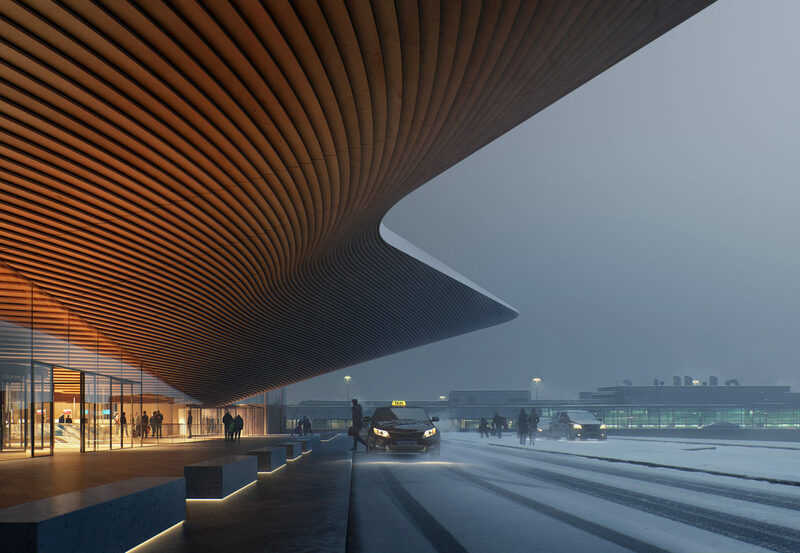 The aim is to simplify the airport structure in such a way that the passenger will recognize both the entrance and the whole process from arriving to the terminal to boarding a plane at a glance. 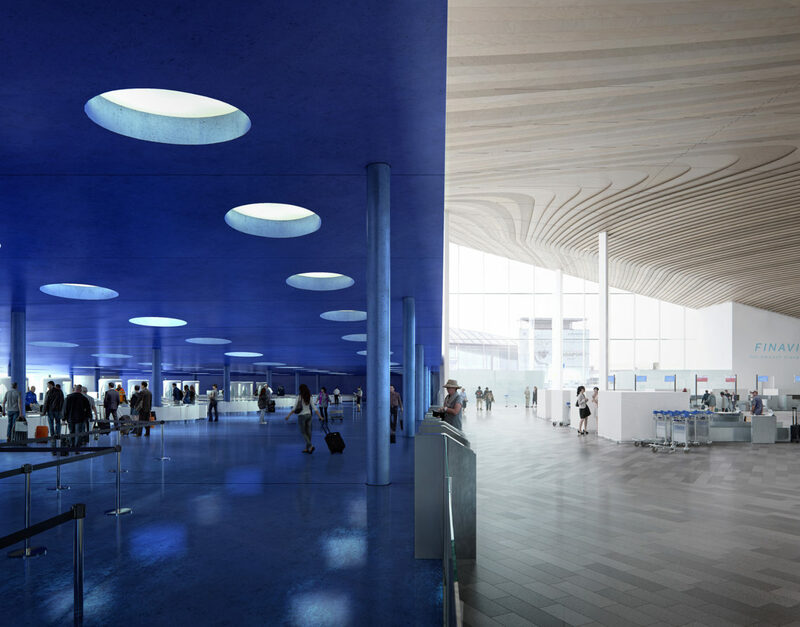 Of the two new volumes “City Hall”, projecting from the overall building volume, will become the new face of the terminal, whereas “Security Box”, even if further back, will be recognizable due to its blue façade coloring. 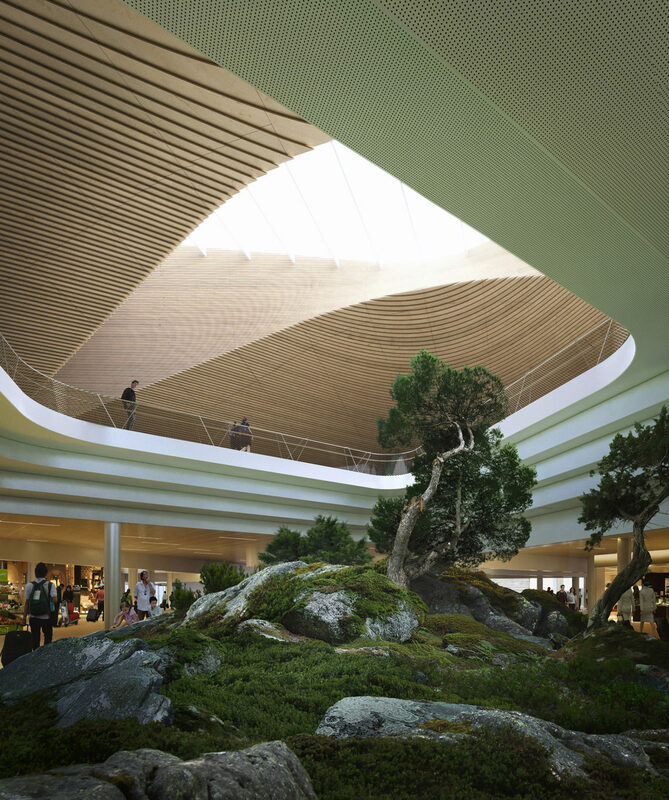 The imposing new departure hall is a continuous space decked by an undulating wooden ceiling. 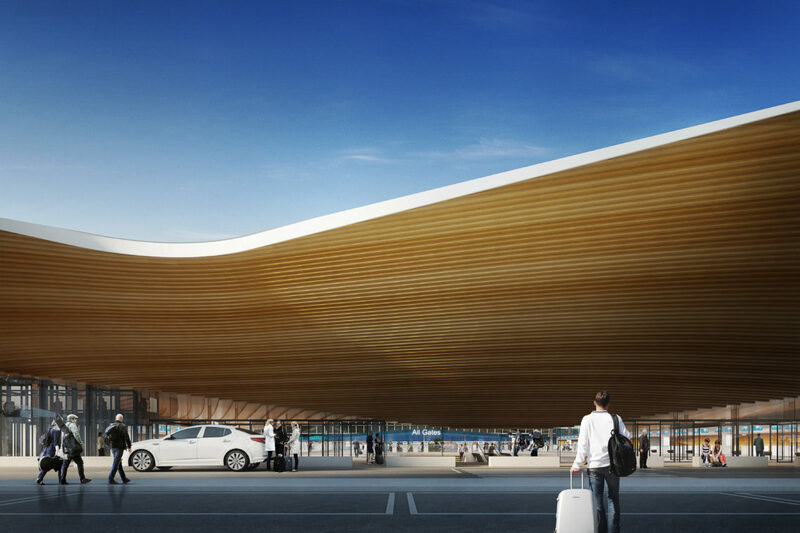 The ceiling will be built of pre-fabricated spruce-clad glulam elements. 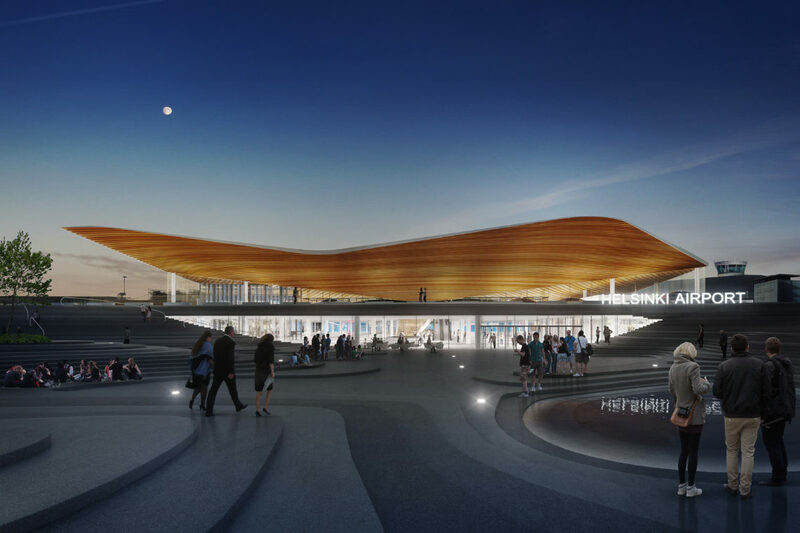 Its design has been greatly influenced by the massive plywood wall sculpture “Ultima Thule” that the Finnish government commissioned from Tapio Wirkkala for the Nordic pavilion at the Expo 67 in Montreal. Wirkkala’s iconic glassware by the same name is still being used in the first class cabins of Finnair’s long haul flights today. Another artwork also presented at the Expo 67, Laila Pullinen’s bas-relief “Sun of the Fells” used to be one of the highlights of the old terminal building, opened in 1969. According to Pullinen, the informalist artwork expresses the forces of nature, the sunset, as well as the rugged Lappish scenery with its shadowy slopes and snow blanket formed by the winds. This description also perfectly fits the new undulating plaza in front of the terminal. The plaza is like a counterpart to the ceiling of “City Hall”. The three-dimensional surface hides the deck-like structure of the plaza and the drop-off ramp. This surface connects the different levels and routes both visually and physically. Runoff is collected to a pool on the plaza that changes shape and size with the seasons. In the wintertime it even transforms to a skating rink. The steps outside the main entrance offer the passengers an optional route from one level to the other while also functioning as seating. The three dimensional design of the deck is also visible to those driving to and from short-term parking underneath. 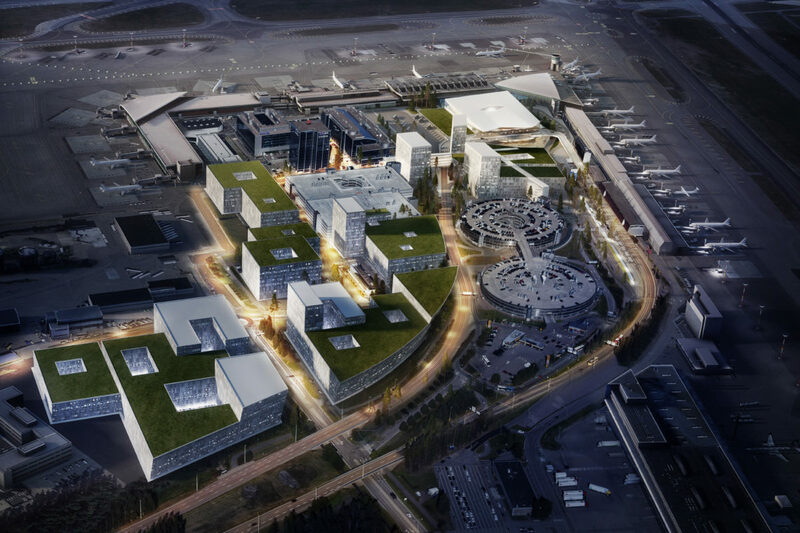 The design of the terminal expansion emphasizes the equality of the routes of the arriving and departing passengers. 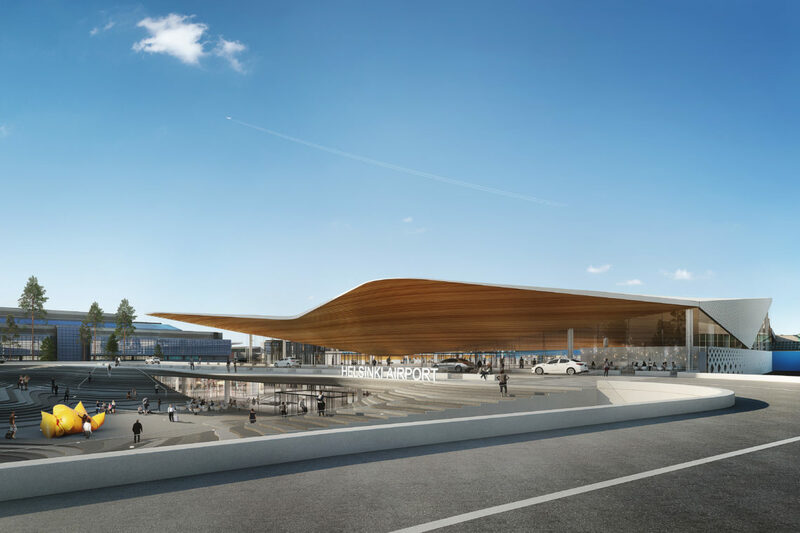 The lower level is used by arriving passengers, as well as by those coming to the terminal by bus, train, bike or foot and those coming from the parking facilities. This is why the identity of this level receives as much attention in the design as the departure hall. 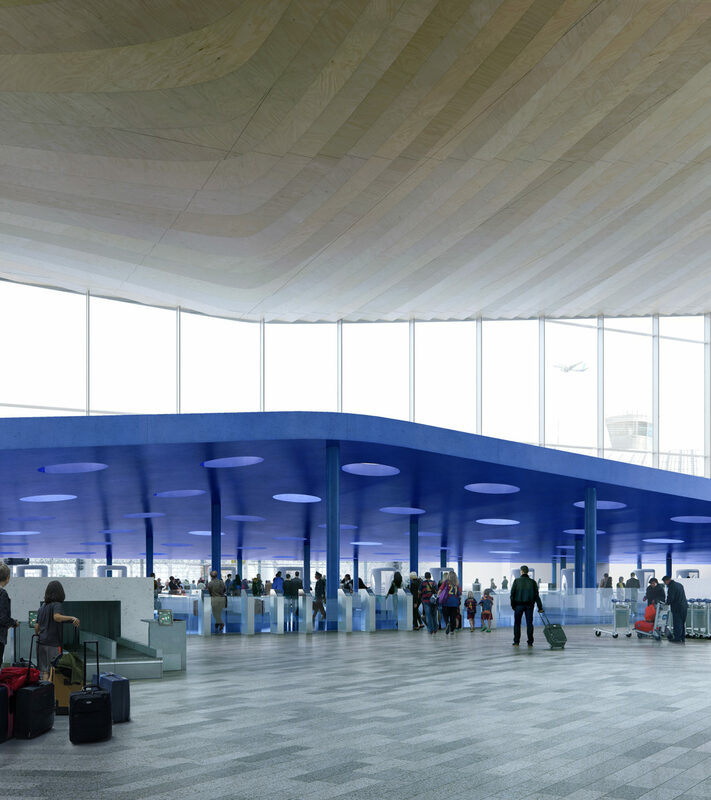 The large openings on the upper departure hall level visually link the two spaces. Finavia aims at both providing passengers with premium quality services and constantly improving the user experience. The four pillars on which the user experience stands are: smooth processes, a wide selection of services, unique architecture and friendly customer service. In the expansion, the straightforward routes and visual orientation points provide for clarity in the user experience. The blue “Security Box” and the air traffic control tower can be seen already from the main entrance. The overall design aids intuitive orientation. In addition to the terminal expansion, there will also be plenty of other new construction at the airport. The new plaza and a new square by the secondary entrance of the train station will be the most important visual orientation points in the area. Taller buildings, pocket parks and bridges also function as orientation points. The availability of optional routes and sufficiency of orientation points result in the urbanity and walkability of the overall design.